Dr. J. MacCalla is the Chief Executive Officer (CEO) at Zyrobotics, responsible for corporate management and implementation of Zyrobotics’ strategic plans. Dr. MacCalla is a serial entrepreneur and has a 35-year executive track record managing technology companies as well as extensive project management experience in high-tech projects with BART, Port of Los Angeles, TRW, NASA, and the U.S. Military. Prior to Zyrobotics, she was the CEO of Automated Switching and Controls Inc., a communications & controls company with over $8M in annual contracts with city & state transit. Before that, Dr. MacCalla was President of Advanced Systems Concepts Inc., overseeing approximately $3M in DOD contracts for military communications and control systems. As Chairman of the LA Metropolitan Transit Authority Foundation she managed their $100M endowment, and was a board member of the California High Speed Rail Commission. She has been a member of the California Council of Science and Technology and the National Office Advisory Panel, member of the Independent Review Panel for the Public Interest Energy Research Program, and is currently a member of the California Science and Technology Policy Fellowship Review Board. She has also held positions as an Associate Professor at the California Polytechnic University in Pomona, Ca. and Adjunct Professor at Spelman College in Atlanta, GA, University of Southern California, and West Coast University in Los Angeles, Ca. Dr. MacCalla holds degrees from Brown University, Stanford University and a Ph.D. in Electrical Engineering from the University of Southern California. 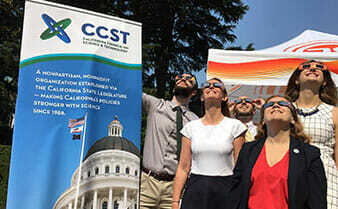 To engage leading experts in science and technology to advise State policymakers - ensuring that California policy is strengthened and informed by scientific knowledge, research, and innovation.